IT would be difficult to imagine a better way of encouraging ДальшеMore>>> students than to let them build an actual aeroplane. This policy, it may be remembered, has been followed at the De Havilland Technical School for some years, the students there first building "Moths," and afterwards a machine actually designed at and for the school. The "T.K.1" was flown in last year's King's Cup Race by Geoffrey de Havilland, jun., and put up a very good show. This year the instructors at the school have designed a low-wing cantilever monoplane, for the race, and the machine has been constructed, with the exception of a few bits of panel beating and such things, rather outside the limits of the beginner, entirely by students of the De Havilland Technical School. Let it be said at once that they have acquitted themselves very creditably of the task. The workmanship is good, and there is nothing "amateurish" in either the design or the construction. The "T.K.2," as this year's D.H.T.S. 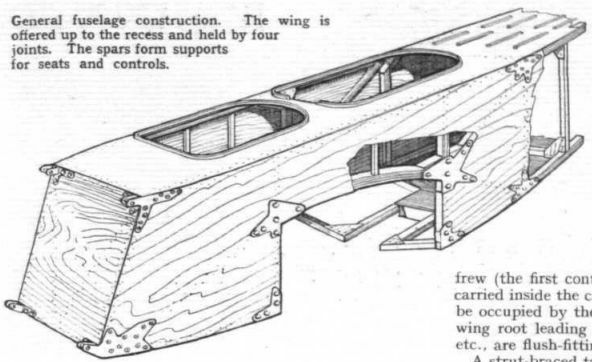 King's Cup machine is called, is a low-wing monoplane, almost entirely of wood construction, but incorporating quite a number of interesting design features. The fuselage, for example, although of the three-ply box type, shows that some thought has been given to the problem. The primary structure which forms the "box" is of quite shallow depth, and the curved deck fairing is a very light skeleton of formers and stringers supporting a fabric covering. Owing to the fact that the machine has an enclosed cabin, the fuselage depth is considerable, and a light structure has resulted from keeping the primary structure shallow. Perhaps it is in the design of the cantilever wing that the greatest ingenuity has been displayed. This is a one-piece affair, the central portion of the wing spars being offered up inside a cut-out in the bottom of the fuselage and forming the support for the two seats, the controls, etc. Four bolted clips secure the wing spars to the fuselage structure. A "box" formed by two main spars, diagonal drag bracing members and top and bottom coverings of three-ply is the primary structure. To this are attached the leading and trailing edge portions, as shown in our sketches. The front spar is left open on its front side and the rear spar on its rear side, and the distance pieces between spar flanges are used for the attachment of nose and trailing edge ribs, as shown. Ailerons with mass balances and differentially-operated ailerons are used, but at present no trailing edge flaps are fitted, although it is intended to experiment later with various forms. 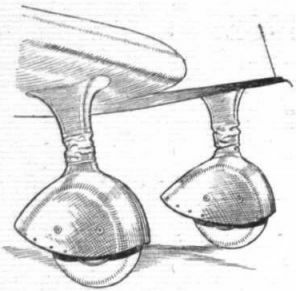 A very simple type of undercarriage has been evolved. Each half consists essentially of a single telescopic tube bolted to the forward face of the front spar, the lower and smaller member carrying the wheel in a symmetrical fork. The inner tube is prevented from turning in the outer by a long key on each side. As there is little tendency for the wheel to turn, it was not thought necessary to use splines around the entire member. The undercarriage wheels and struts are covered in spats and fairings. Originally a "Leopard Moth" tail wheel was fitted, but a short stub skid has now replaced this and is carried on the original tailwheel mounting. The engine of the “T.K.2" is a high-compression "Gipsy Major" developing approximately 140 b.h.p. 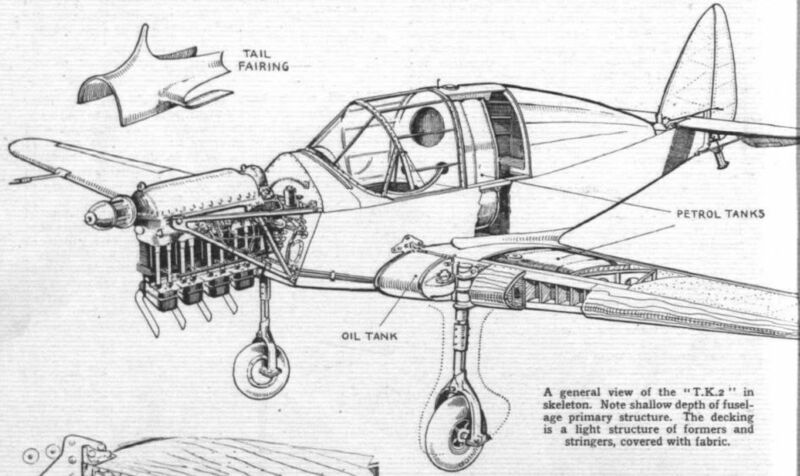 Normally the machine is intended to carry pilot and one passenger, and the petrol is then contained in two tanks, one on each side, in the wing slightly outboard of the fuselage. For the race, however, a special tank has been made so as to enable the machine to do the flight from Hatfield to Renfrew (the first control in the race) non-stop. This tank is carried inside the cabin, in the place which would normally be occupied by the passenger. The oil tank is in the port wing root leading edge. All filler caps, inspection doors, etc., are flush-fitting. A strut-braced tailplane of wooden construction is fitted. Its angle of incidence can be altered while the machine is on the ground, but for trimming during flight "tabs" are used on the elevators. These are similar to the "tabs" on the "Hornet Moth," and are operated by Bowden cables from a lever on the starboard side of the cabin. 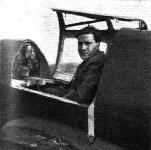 The flying controls themselves are of the well-known Desoutter type. 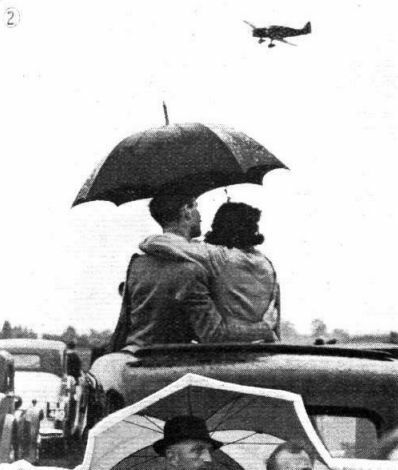 Owing to the fairly high position of the pilot's seat and the low height of the fuselage walls, the view is particularly good, it being possible to look forward and downward without having to crane one's neck. The "T.K.2" was flown for the first time last Friday by Capt. Broad, who expressed himself generally satisfied with the machine. Performance figures are not available, but from the fact that the power is 140 b.h.p., the wing area 125 sq. ft., and the gross weight 1,500 lb., readers may, perhaps, make reasonably close "guesses." After the race the large petrol tank will be removed from the cabin, a second seat installed, and the machine may then possibly be used for research purposes. 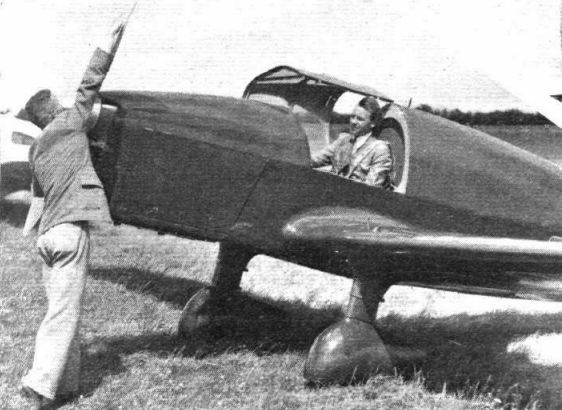 The T.K.2, produced by the D.H. Technical School at Hatfield in 1935. As Lord Wakefield's entry, the T.K.2, designed and built by the De Havilland Technical School, will certainly be a centre of interest. The "T.K.2" before it received its final coat of paint. It is also minus its spats. 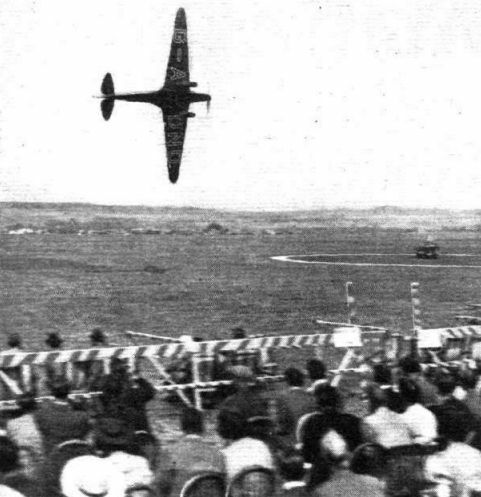 The T.K.2, built by students of the D.H. Technical School, makes a fast and clean take-off in the Final in the hands of Capt. Broad. The De Havilland Technical School's T.K.2 in its latest form. W. Humble (Hawk Speed Six) taxies in at Shoreham on Friday behind Waight's fascinating little T.K.2. KING'S CUP CAMEOS Caught by the Camera at Hatfield. T.K.2 - and two. 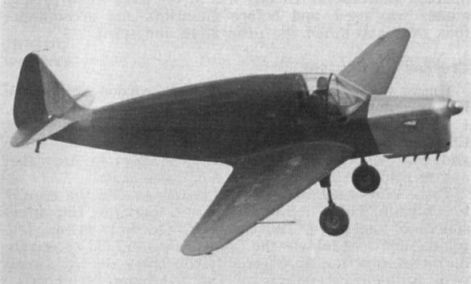 The T.K.2 Single-seat Light Monoplane (137 h.p. D.H. "Gipsy-Major" Series II engine). The winner of the Haston-Cardiff race, Mr. R. J. Waight, in the cockpit of the T.K.2. Load-testing a wing of the D.H. Technical School's new King's Cup machine. 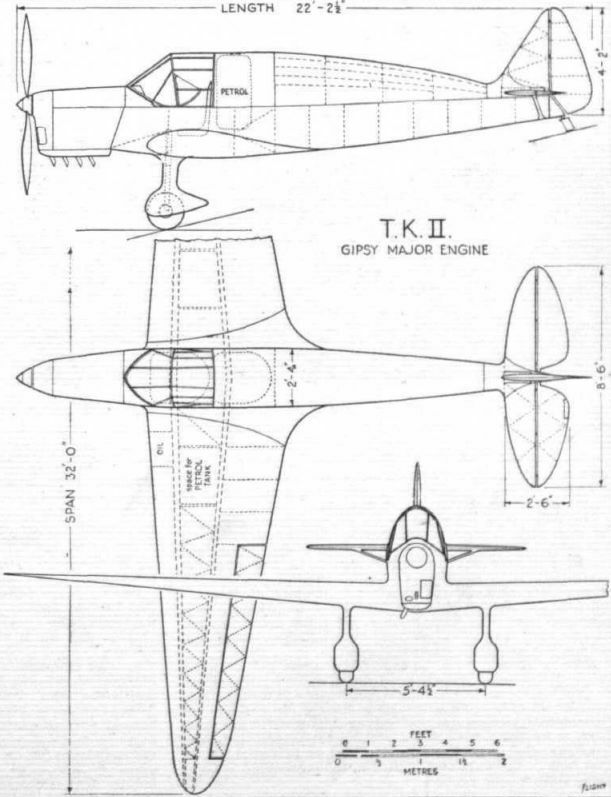 A general view of the "T.K.2" in skeleton. Note shallow depth of fuselage primary structure. The decking is a light structure of formers and stringers, covered with fabric. The oil tank is built into the leading edge of the port wing root. One of the four bolted joints which secure wing to fuselage is also shown, as well as the attachment of the undercarriage leg to the front spar. Details of the wing construction. The primary structure is in the form of a box, comprising the two main spars and the plywood covering. Leading and trailing edge ribs are then attached to this box. Details of spar joints, etc., are also shown. General fuselage construction. The wing is offered up to the recess and held by four joints. The spars form supports for seats and controls. 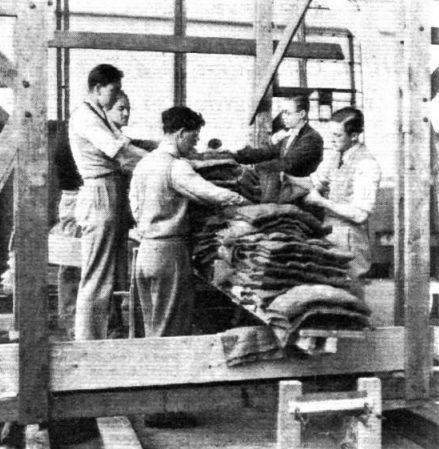 Shape is maintained in the centre portion of the compression legs of the T.K.2 by coiled springs behind the fabric. A complete revision of the lines of the upper section of the fuselage added speed and grace to the T.K.2. 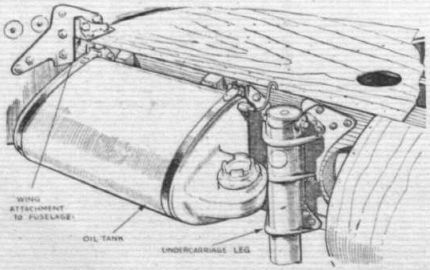 This sketch shows the new cabin and undercarriage. On the right is the general view of the empennage.